Microsoft recently relaunched Outlook.com a few months back and people have been raving about the web app ever since. 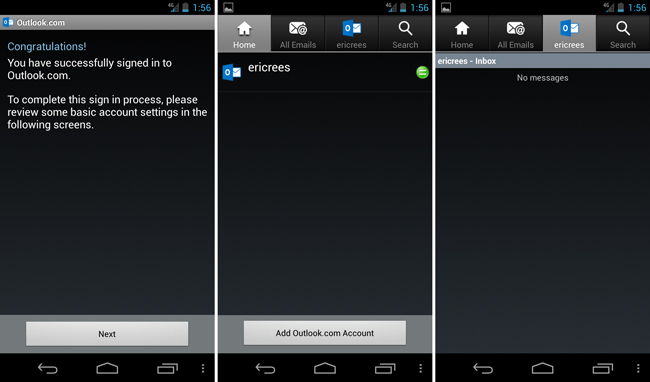 It seems Microsoft was working on an Android Outlook app, but it’s obvious that they didn’t spend long. The app is in Google Play now, but I only suggest downloading it if you are looking for a blast back through Android’s past. You get the feeling you are running Froyo or Gingerbread once you log yourself in. If this application looked only half as good as the web version of Outlook.com, it would look about 20 times better than it does now. If I used Outlook and was waiting for this to launch on Android, this might legitimately push me towards Gmail for good. But if you just have to have your Exchange email, the app is free for download in Google Play now.